By Peter Anderson 10 Comments - The content of this website often contains affiliate links and I may be compensated if you buy through those links (at no cost to you!). Learn more about how we make money. Last edited February 28, 2013 . I‘ve been running Bible Money Matters for almost a year and a half now. It's been a labor of love, and during that time I've tried to write at least 5 quality posts every week. Writing that much can get exhausting over time. This year i decided that I may want to bring some contributors on board to help give us a fresh perspective on things, and to also give me a break from writing quite so much. The only problem is that whoever I allowed to write for the site had to be able to write quality content, and at the same time hold a lot of the same values that I do. Finding someone that fit the bill was no small task! A few months ago I brought on board a great writer and person to write devotionals for the site on Sundays, Jason Mitchener. He's done a great job, and we look forward to more great devotional posts from him in the coming weeks. This past week I asked another great writer to come on board to write some more biblically based personal finance content. Thankfully he agreed to give it a shot! Craig Ford was born and raised in the South Pacific nation of Papua New Guinea (PNG). For ten years he lived in PNG as his family continued doing missionary work. At age ten, Craig's family moved to Canada, his country of citizenship. After nine years of living in Canada, Craig did school work at several institutions in the United States (Rochester College, York College, Abilene Christian College, and Harding University Graduate School of Religion). During this time he earned an AA, BA, and an Masters of Divinity degree, all in the field of Biblical Studies. Over the last ten years Craig has worked in several ministry-related positions, including youth ministry, pulpit preaching ministry and missionary work. Craig is married to a wonderful woman originally from Cheyenne, Wyoming. They have three young children, all of whom carry dual citizenship between Canada and the United States. In 2006, the Ford family moved to Alotau, PNG to begin working towards preaching the good news to those in need of the gospel message. Present financial teachings from a Biblical perspective. 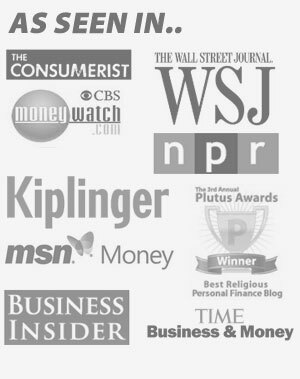 Publish daily posts on topics that impact all aspects of personal finances. This includes practical tips for saving, earning, giving, and managing your money. Take a behind the scenes look at our finances – the motivations, impulses, and the spiritual implications of our financial decisions. All of these components will help us honor God with our finances. In terms of his view of the relationship between money and Christianity, Craig highlights that Jesus taught a lot about money. Some say it was his second most discussed topic, second only to the Kingdom of God/Heaven. Jesus taught about money because he knows we are always learning. Our view of money can either be taught in a way that will honor God, or it will be caught from the popular views of the surrounding culture. Jesus preferred to teach how God wants us to handle money because where there is not teaching money can so easily become our Master (Mt. 6:24). In a similar way, Paul identifies two options for Christians: (1) be transformed, or (2) be conformed (Rom. 12:2). If we are not taught about Christian finances, our knowledge and practice will naturally conform. If, however, we study God's teachings about money we have the opportunity to transform ourselves and our culture for the Glory of God. Welcome to Bible Money Matters Craig. Your background is very interesting. I look forward to reading more of your articles. The Debt Hawk´s last blog ..Is All Debt Bad? Welcome Craig. I look forward to reading your posts. You have a pretty broad and varied background and that will be interesting to see in your posts. I would love to see to here more about money or lack there of in PNG. Finally, giving is an awesome topic and one that is dear to my heart. I am a cheap miser by nature and have been invited deeper in that area especially as it relates to my side businesses and giving myself(and money). It is any area where I need to take action to start the journey towards wholeness rather than ‘thinking’ about the how to be a better giver. Awesome! I really enjoy reading both of your blogs. This is great. I really like the thought provoking posts you guys provide. Looking forward to more. Welcome, Craig! It’s always interesting to see what’s happening on Bible Money Matters, and you should definitely provide plenty of good insight with your background. I’ve been digging Craig’s writing over at MHFC. It is refreshing to see another PF blogger write from the wise and stable viewpoint of biblical monetary principles. I look forward to your articles here Craig, and hope writing here helps give you more exposure on your own endeavors as well. I discovered Craig’s site a couple weeks ago (I believe I followed a mention here) and am a fan of his writing. Look forward to reading his posts here as well. Welcome, Craig! Welcome Craig, looking forward to reading more! Thanks for all the positive comments. I greatly appreciate it. I look forward to discussions with everyone through the comments over the next several weeks. You have a great blog here. I never thought about PF from a biblical perspective,. Welcome home Craig. Look forward to read more of your work. Previous Post: Saving Up And Paying Cash For The Things You Buy Makes The Purchase More Enjoyable!